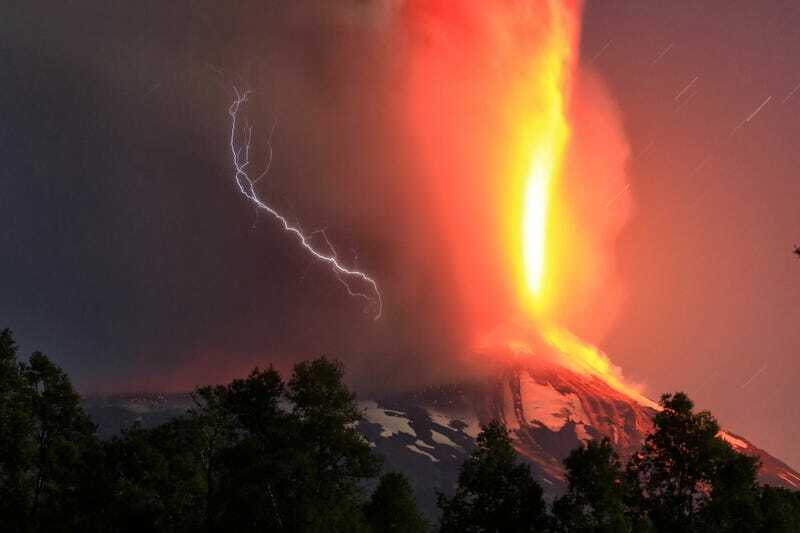 The Villarica volcano near Pucón, Chile erupted early Tuesday morning, spewing a spectacular fountain of lava and ash that extended hundreds of meter into the air. According to Chile's National Emergency Office, Villarica erupted around 3 a.m. local time, and has forced more than 3,000 people to evacuate from surrounding towns. Fortunately, the eruption wasn't unexpected; yesterday, Chile's National Geology and Mining Service issued an orange alert after confirming a spike in local seismic activity, which, a press release noted, "has increased three times compared with early February," when the organization had previously declared a yellow alert. The volcano was violently active for only a few minutes (and accompanied by lightning) before dying down, but photos taken a few hours after the eruption show the volcano smoldering in the bright light of morning. Volcanic Lightning: How does it work?! While photos like the ones above show traces of small lava flows, Reuters reports that a major lava flow is not currently expected, though Luis Lara, head of Chile's National Geology and Mining Service, says that could change.